If you don’t need the outright practicality of the hatchback door, the Civic Saloon is easily the more comfortable option. It might even breathe new life into the small saloon sector. 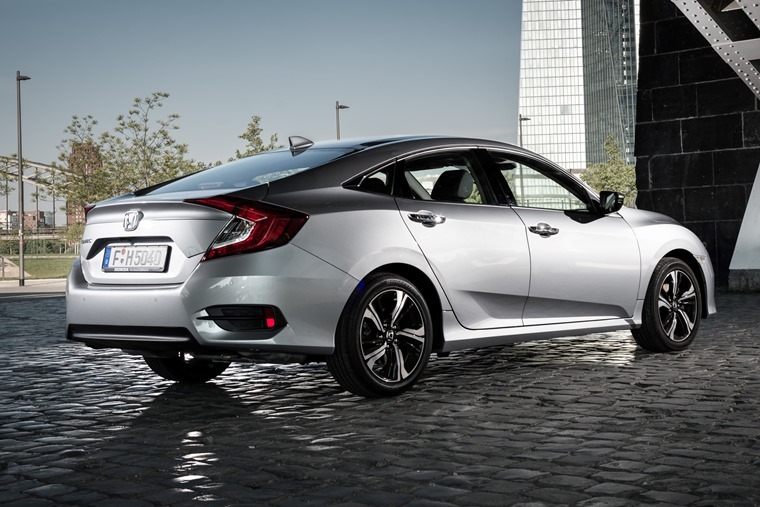 Saloons are usually the preserve of the premium end of the market, so Honda has taken a bold step by introducing its Civic four-door. It’s an intriguing move and one that makes more sense than you might at first think. How so? For starters, the Civic saloon’s styling is a little more conservative, which will no doubt chime with some of its traditional customer base. There’s still enough of the sharply creased design to make the four-door stand out in a crowd, but it’s not quite as look-at-me as the hatch. Of course, the switch to the saloon shape means forgoing the practicality of a tailgate, which is why the hatch has become the default shape in the UK, though not across the whole of Europe where small saloons remain popular. The loss of the fifth door is not a major problem here as Honda has increased the saloon’s boot to 519-litres of volume with the rear seats in use compared to the hatch’s 478-litres. It provides a useful step up in size and you’ll be hard-pressed to fill it with the weekly shop. Even a full complement of holiday baggage would fit in here without the need for Rubik’s Cube dexterity. It provides a useful step up in size and you’ll be hard-pressed to fill it with the weekly shop. 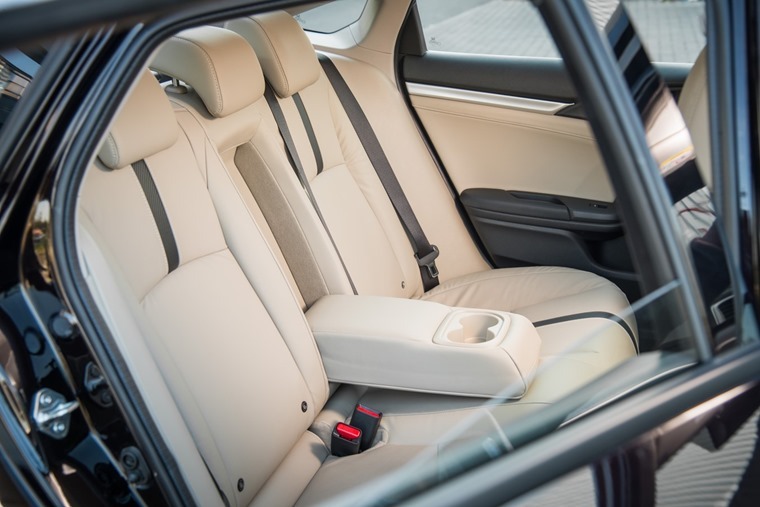 To free up even more space, the saloon’s 60/40 split and fold rear seats tilt forward to release a maximum of 828-litres, which is a little behind the hatch’s. No matter, the floor is flat and long and, thanks to the wide boot aperture it’s simple to slot in bigger bags. The only time you will miss the hatch’s extra opening size is for those bulky boxes that come from visiting the DIY store. However, levers in the side walls of the boot make it easy to drop the rear seats without faffing with lugs on the seat backs. Move forward from the boot into the rear seats and there’s still very generous room in the saloon for passengers. It’s the same when you graduate to the front cabin, where the driver sits quite low in the car compared to some rivals, but we rather liked this for the feeling of being ‘in’ rather than ‘on’ the car. Almost everything else from the driver’s seat is identical to the hatch, so no complaints about comfort, ergonomics or equipment. One gripe we do have, though, is the slope of the saloon’s rear screen means the driver’s vision is limited over the left shoulder when changing lanes, pulling out of angled junctions and parking in tighter spots. Almost everything inside is identical to the hatch, so no complaints about comfort, ergonomics or equipment. Otherwise, the driving side of the Civic saloon is very enjoyable. You might think this would be a case of checking off the saloon as being identical to the hatch in its dynamic manners. However, Honda is a company that often likes to introduce a few changes between apparently similar models. The Civic saloon is no different. As a consequence, the suspension has been softened off a little for the four-door model, which is a good move in our minds as it makes the saloon more compliant and comfortable than the hatch. Honda has also tweaked the steering of the saloon over the five-door model’s, though we couldn’t detect any reason for this or discernible difference. Either way, the saloon steers with the same lightness at parking speeds and feel at higher speeds as its hatch sibling. Don’t expect Type R levels of feedback, but then this is a car for ferrying the kids and commuting in rather than laser guiding down twisting roads. Even so, the saloon turns into corners nimbly and holds its line with good reserves of traction. Don’t expect Type R levels of feedback, but then this is a car for ferrying the kids and commuting in. One area where we would like to see an improvement is the sound-proofing of the Civic saloon from road and wind noise. This is a complaint common to this model and the hatch, but the engine compensates by keeping itself hushed even when pressed hard. This is true whether you take the petrol or diesel as your motor of choice. We tried the six-speed manual transmission and 1.6-litre turbodiesel engine combination, which is the ideal version for those covering big distances on a regular basis. It sips fuel at a combined figure of 83.1mpg and emits 91g/km of CO2. This motor pulls keenly on the motorway so you don’t have to disturb the gear lever when cruising. There’s also a nine-speed automatic transmission, but that comes with a noticeable drop in economy and rise in emissions to 68.9mpg and 108g/km. The 1.6-litre engine pulls keenly on the motorway so you don’t have to disturb the gear lever when cruising. 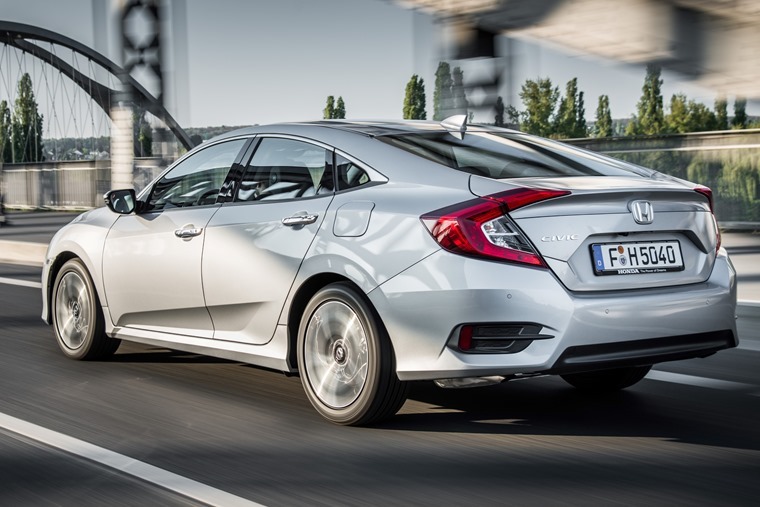 A 1.0-litre turbo petrol engine is the other choice in the Civic saloon and it’s the one to go for if most of your driving is short-hop commuting or around town. Combined consumption registers at 58.9mpg for the manual and 60.1mpg for the CVT (continuously variable transmission) auto, with 110- and 107g/km emissions respectively. The petrol is peppy enough in most situations, but we reckon the diesel is the better of the two options in most conditions. You can also pick any of the four engine and gearbox offerings in SE, SR or EX trim levels. Each comes with alloy wheels, automatic headlights and a Bluetooth hands-free phone connection. However, you need to step up from the SE with its 5in infotainment screen to the SR to get the larger and easier to use 7-inch monitor that also comes with satnav, internet browsing and connectivity for smartphones. This trim also has a reversing camera, climate control instead of air conditioning, and powered driver’s seat lumbar adjustment. The EX gains keyless entry and ignition, leather upholstery, sunroof, heated front seats, blind spot monitor and wireless phone charging. Safety kit includes Lane Departure Warning, Lane Keep Assist, Traffic Sign Recognition System and Forward Collision Warning. 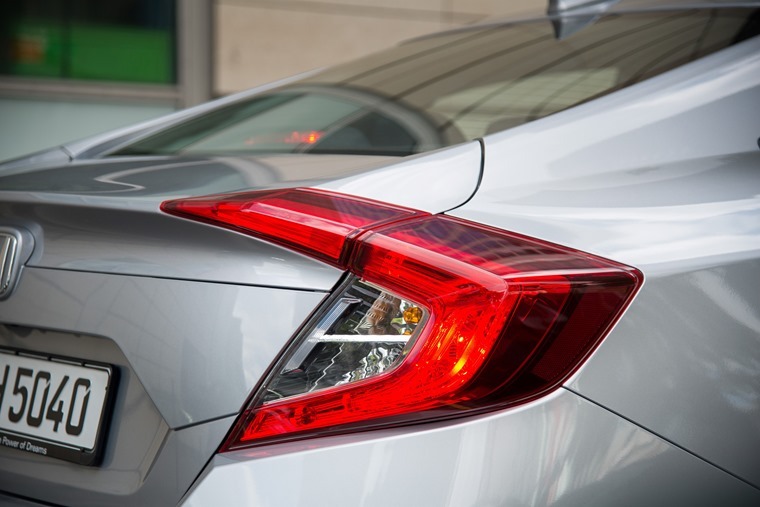 On the safety front, you have all the same kit as in the hatch, which includes Lane Departure Warning and Lane Keep Assist, a Traffic Sign Recognition System, Intelligent Speed Limiter, and Forward Collision Warning and Collision Mitigation Braking to alert and avoid of impending impacts. Adaptive Cruise Control maintains a safe distance to the vehicle ahead, while Hill Start Assist prevents the car rolling backwards as you pull away on inclines. 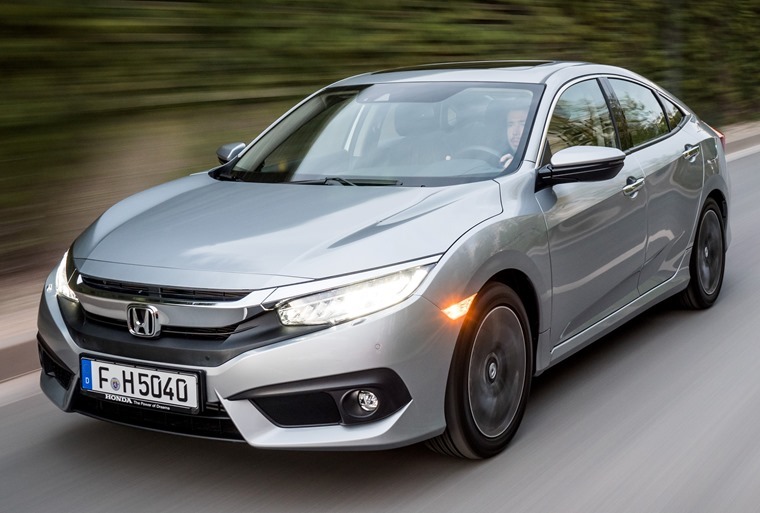 With prices from £19,395, or £21,240 for our preferred 1.6 i-DTEC diesel model with manual gearbox in SR trim from £22,590, the Civic saloon is a little pricier than the hatch. If you don’t need the outright practicality of that five-door model, we reckon the saloon is the more comfortable option and shows Honda may well be onto something by breathing new life into the small saloon sector.